A Voronoi diagram is the computational geometry concept that represents partition of the given space onto regions, with bounds determined by distances to a specified family of objects. The application area of this concept varies from Archaeology to Zoology. The Boost.Polygon Voronoi extension provides implementation of the Voronoi diagram data structure in the 2D space. The internal representation consists of the three arrays, that respectively contain: Voronoi cells (represent the area around the input sites bounded by the Voronoi edges), Voronoi vertices (points where three or more Voronoi edges intersect), Voronoi edges (one dimensional curves containing points equidistant from the two closest input sites). Each of the primitives (cell, vertex, edge) contains pointers to the other linked primitives, so that it's always possible to efficiently traverse the Voronoi graph. The picture below shows the Voronoi vertices in red, Voronoi edges in black, input sites that correspond to the Voronoi cells in blue. It is considered, that each input segment consists of the three sites: segment itself and its endpoints. As the result, two additional Voronoi edges are constructed per each input segment. This is made to simplify the representation of the Voronoi diagram and Voronoi edges in particular. All the Voronoi primitive data structures (edge, vertex, cell) contain mutable color member. Color type is equivalent to the std::size_t type, except that the upper five bits are reserved for the internal usage. That means, that the maximum supported value by the color member is 32 times less than the one supported by std::size_t. T - the coordinate type of the Voronoi vertices. TRAITS - the Voronoi diagram traits. void clear() Removes all primitives from the Voronoi diagram. const cell_container_type& cells() const Returns the const reference to the cell container. const vertex_container_type& vertices() const Returns the const reference to the vertex container. const edge_container_type& edges() const Returns the const reference to the edge container. size_t num_cells() const Returns the number of the Voronoi cells in the Voronoi diagram. size_t num_edges() const Returns the number of the Voronoi edges (half-edges) in the Voronoi diagram. size_t num_vertices() const Returns the number of the Voronoi vertices in the Voronoi diagram. cell_container_type Container of the Voronoi cells. const_cell_iterator Const cell container iterator. vertex_container_type Container of the Voronoi vertices. const_vertex_iterator Const vertex container iterator. edge_container_type Container of the Voronoi edges. const_edge_iterator Const edge container iterator. The Voronoi diagram data structure doesn't embed coordinates of the input geometries. Instead it links with those via source index and source category methods of the Voronoi cell primitive. Source index is incrementally given (starting from zero) to each input site inserted into the Voronoi builder. Considering the fact, that each input segment is splitted onto three separate sites with the same index, we distinguish between those using source category. For more examples check the Voronoi basic tutorial. Defines geometric category of the input object. Defines semantic category of the input site. GeometryCategory geometry_category) Returns true if the given source category belongs to the given geometry category. A Voronoi edge is a one-dimenstion curve, that contains points equidistant from the two closest input geometries. The Voronoi edge data structure is implemented as the enhanced classical half-edge data structure. On the image below, the Voronoi edges are drawn as directed linear (e.g. AE) or curved (e.g. DE) dashed lines of either green (e.g. AE) or black (e.g DE) color. The green edges are considered to be secondary, as they are generated by an input segment and its endpoint (e.g. edge EA, made by segment MN and its endpoint M). All the other edges are considered to be primary (e.g. curved edge CD, made by segment KL and point N). Apart from that, each edge can be finite (e.g. ED) or infinite (e.g. edge starting at point B and going in the east direction). voronoi_edge(bool is_linear, bool is_primary) Voronoi edge constructor. voronoi_cell_type* cell() Returns the pointer to the Voronoi cell that the edge belongs to. const voronoi_cell_type* cell() const Returns the const pointer to the Voronoi cell that the edge belongs to. void cell(voronoi_cell_type* c) Sets the Voronoi cell pointer to the cell the current edge belongs to. voronoi_vertex_type* vertex0() Returns the pointer to the start point of the edge. If the edge is infinite in that direction returns NULL. const voronoi_vertex_type* vertex0() const Returns the const pointer to the start point vertex of the edge. void vertex0(voronoi_vertex_type* v) Sets the start point pointer of the edge. voronoi_vertex_type* vertex1() Returns the pointer to the end point of the edge. const voronoi_vertex_type* vertex1() const Returns the const pointer to the end point of the edge. voronoi_edge_type* twin() Returns the pointer to the twin edge. const voronoi_edge_type* twin() const Returns the const pointer to the twin edge. void twin(voronoi_edge_type* e) Sets the twin edge pointer of the edge. voronoi_edge_type* next() Returns the pointer to the CCW next edge within the corresponding Voronoi cell. Edges not necessarily share a common vertex (e.g. infinite edges). const voronoi_edge_type* next() const Returns the const pointer to the CCW next edge within the corresponding Voronoi cell. void next(voronoi_edge_type* e) Sets the CCW next edge pointer of the edge. voronoi_edge_type* prev() Returns the pointer to the CCW prev edge within the corresponding Voronoi cell. const voronoi_edge_type* prev() const Returns the const pointer to the CCW prev edge within the corresponding Voronoi cell. void prev(voronoi_edge_type* e) Sets the CCW prev edge pointer of the edge. color_type color() const Returns the color value. void color(color_type color) const Sets the color of the edge. Allows to associate the user provided data with the primitive. voronoi_edge_type* rot_next() Returns the pointer to the CCW next edge rotated around the edge start point. Works for infinite edges as well. const voronoi_edge_type* rot_next() const Returns the const pointer to the CCW next edge rotated around the edge start point. voronoi_edge_type* rot_prev() Returns the pointer to the CCW prev edge rotated around the edge start point. const voronoi_edge_type* rot_prev() const Returns the const pointer to the CCW prev edge rotated around the edge start point. bool is_finite() const Returns true if the both end points of the edge are finite, else false. bool is_infinite() const Returns true if one of the end points of the edge is infinite, else false. bool is_linear() const Returns true if the edge is linear (segment, ray, line), else false. bool is_curved() const Returns true if the edge is curved (parabolic arc), else false. bool is_primary() const Returns false if the edge goes through the endpoint of the segment site, else true. bool is_secondary() const Returns true if the edge goes through the endpoint of the segment site, else false. All the above methods have O(1) complexity. The size of the Voronoi edge structure is equal to: 5 * sizeof(void *) + sizeof(size_t). color_type Color type (check the Important section). A Voronoi cell represents a region of the Voronoi diagram bounded by the Voronoi edges. On the image below, there are 7 such regions: P, Q, R, S, T, U, V. Each Voronoi cell can contain a point (e.g. cells Q, S, T, U, V with corresponding input sources N, K, L, O, M respectively) or a segment (e.g. cells P and R with corresponding input sources MN and KL respectively) as its source. The Voronoi cell primitive doesn't contain coordinates of the source geometry, instead it stores the index and category of the source geometry. Source index corresponds to the unique id, issued to each input geometry (e.g. incremental counter, used by the Voronoi builder). Such an index uniquely identifies any input point (e.g. O), however doesn't make any distinction between segment (e.g. MN) and both its end points (e.g. M, N). In order to resolve possible ambiguity, the source category is used, that specifies the semantic topology of the input object (e.g. segment's startpoint, segment's endpoint or segment itself). The Voronoi cell data structure also provides access to a random Voronoi edge, located on the boundary of the cell (e.g. 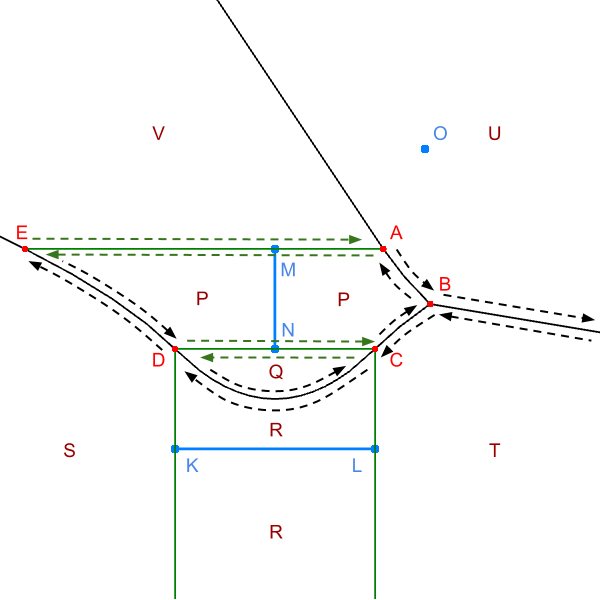 edge AE for the cell P). source_category_type source_category) Voronoi cell constructor. source_index_type source_index() const Returns input site index among the other sites. Both segment and its end points will have the same index. source_category_type source_category() const Returns input site category among the other sites. Allows to distinguish between segment site and its endpoints. voronoi_edge_type* incident_edge() Returns the pointer to the one of the boundary edges. const voronoi_edge_type* incident_edge() const Returns the const pointer to the one of the boundary edges. void incident_edge(voronoi_edge_type* e) Sets the incident boundary edge pointer of the cell. color_type color() const Returns the color associated with the cell. void color(color_type color) const Sets the color of the cell. bool contains_point() const Returns true if the cell contains a point site, else false. bool contains_segment() const Returns true if the cell contains a segment site, else false. bool is_degenerate() const Returns true if the cell doesn't have an incident edge. Can happen if a few input segments share a common endpoint. All the above methods have O(1) complexity. The size of the Voronoi cell structure is equal to: sizeof(void *) + 2 * sizeof(size_t). // Do smth. with edge. A Voronoi vertex represents a point, that is equidistant from the three or more input geometries. As a consequence, it corresponds to the point of the intersection of the three or more Voronoi edges. On the image below, there are 5 such vertices: A, B, C, D, E. The Voronoi vertex data structure embeds the coordinates of the underlying point and provides access to a random Voronoi edge originating from the vertex (e.g. edge BC for the vertex B). const coordinate_type& y) Voronoi vertex constructor. 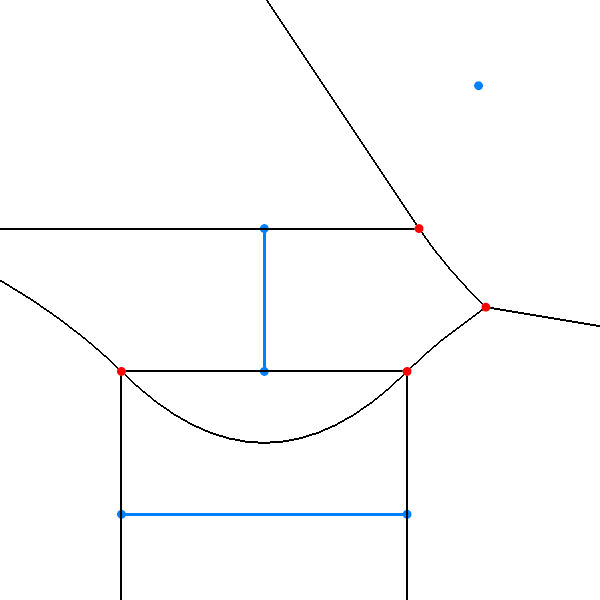 const point_type& x() const Returns the x-coordinate of the point that represents the vertex. const point_type& y() const Returns the y-coordinate of the point that represents the vertex. voronoi_edge_type* incident_edge() Returns the incident edge pointer. const voronoi_edge_type* incident_edge() const Returns the const pointer to the incident edge. void incident_edge(voronoi_edge_type* e) Sets the incident edge pointer. color_type color() const Returns the color associated with the vertex. void color(color_type color) const Sets the color of the vertex. All the above methods have O(1) complexity. The size of the Voronoi vertex structure is equal to: sizeof(void *) + sizeof(size_t) + 2 * sizeof(coordinate_type). The Voronoi diagram traits are used to configure the Voronoi primitive types and predicates, used by the Voronoi diagram data structure. The implementation includes default traits specialization for the double output coordinate type. coordinate_type Coordinate type of the Voronoi diagram primitives. vertex_equality_predicate_type Predicate that returns true if the two points are considered to be equal. False otherwise. It is used to unite nearby Voronoi vertices.